Releasing a film like The Man Who Knew Infinity on the cusp of summer blockbuster season—which, like Christmas, seems to come earlier every year—is an odd choice. This is the very definition of the kind of movie people complain that “they” don’t make anymore: a modestly budgeted, character-driven drama for adults that doesn’t insult the viewer’s intelligence or lean on shock value. While the director is a relative newcomer, it’s got some name actors, most notably stars Dev Patel and Jeremy Irons. And while neither give Oscar-worthy performances, both operate at the level one might expect (i.e., a high one). So why bury it between competing blockbusters about superheroes punching each other, instead of releasing it into the more mature fall movie ecosystem? Maybe because on paper, a “math biopic” sounds pretty dull. Patel stars as unjustly obscure—outside of India and academic circles, anyway—mathematician Srinivasa Ramanujan, who, despite having no formal education, possessed a unique genius for mathematical abstraction. Born in the late 19th century, Ramanujan developed many of his initial theories in isolation. He worked as a clerk before leaving his wife Janaki (Devika Bhise) and mother behind and coming to Cambridge at the invitation of professor G.H. 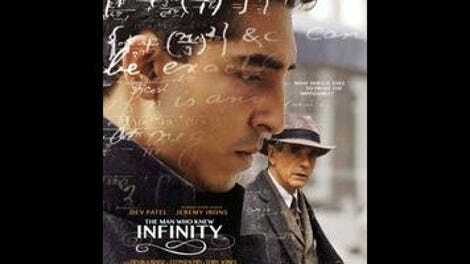 Hardy (Jeremy Irons), who was intrigued when Ramanujan sent him a letter containing examples of his work. Ramanujan arrived on the eve of World War I, and the duo ended up becoming close friends and working together for five years, with the young man’s work evolving under Hardy’s mentorship. The Man Who Knew Infinity is a pleasant surprise. The premise seems to promise cartoonish racism and schmaltzy uplift, as well as scenes of men in tweed suits excitedly scribbling on blackboards and crying out, “I’ve got it!” Well, the tweed suit part is true. 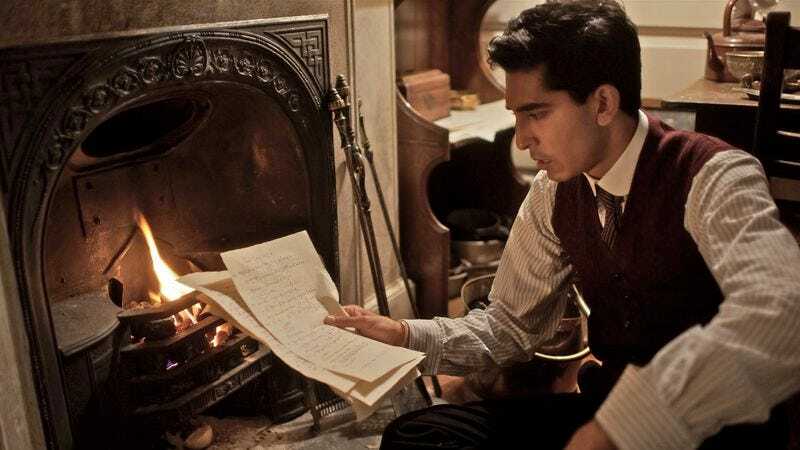 The rest, thank goodness, is not so clichéd: While Ramanujan does experience racism when he moves to England—at one point being badly beaten by a group of soldiers—he also meets sympathetic Englishmen and other Indian students. There are scenes of men writing on chalkboards, but the big breakthrough happens off screen and is revealed in the form of a stack of paper placed on Hardy’s desk. There’s even a well-placed one-liner here and there. The film is similarly subtle in its depiction of Indian culture, incorporating specific details into the story without feeling the need to over-explain everything. The math element is played casually as well, in discussions that are not complex enough to go over the layman’s head, but not condescending, either. However, there is a real downside to all this even-handedness, and it’s that—especially towards the beginning of the film, before the life-and-death stakes are introduced—the conflict can seem slight. That’s when the main character’s confidence can come off as cocky, and his refusal to bend to Hardy’s (reasonable) insistence on proving his theories more like a temper tantrum than a fit of genius. It downplays the tension in the romantic subplot as well, reducing Janaki’s emotional struggle to a footnote. But the stakes do eventually get raised, and themes do begin to emerge, largely in the relationship between Patel’s spiritual Ramanujan and Irons’ atheistic Hardy. There isn’t a lot of emotion in their bond, which is fair, given that both characters profess to love numbers more than people. The actors have great rapport, discussing the importance of academic rigor and the quest for scientific immortality. Eventually, as the ivory tower of Cambridge is confronted with the reality of war, this leads into a larger conversation about reason and faith, science and God, the provable and the inscrutable, and how to reconcile these competing elements. There’s nothing especially innovative in how this is all presented, and it all works out pretty much the way it usually does in these movies. But, especially at this time of year, it’s kind of nice to see a movie more interested in intellectual sparring than the physical kind.